1. Put 100g granulated sugar in a saucepan with the red wine and 50ml water and heat gently, stirring to help the sugar melt. Boil for 2 minutes then leave to cool. Whizz the raspberries in a food processor, then sieve (through nylon rather than metal). shallow container for about 4-5 hours forking the mixture 4 times during the freezing process to break up the crystals. You want to end up with a mixture that resembles shards of ice. 3. For the peaches, put the wine, 125ml water, sugar and lemon zest into a deep sauté pan or wide saucepan in which the fruit will fit in a single layer, and slowly bring to a simmer, stirring a little to help the sugar melt. Keep the liquid simmering and add the peaches. Depending on how ripe they are, poach them for 25-35 minutes until they are tender, turning them over every so often to make sure they are cooking evenly. 4. Lift the peaches out of the poaching liquid (keep the liquid but discard the lemon zest), and once they are cool enough to handle, gently remove the skins – they should just slip off. 5. The peach cooking liquor should be a little syrupy. If it isn’t, boil to reduce, but don’t go so far that you don’t have enough liquid to provide a couple of tablespoons per peach when you serve. 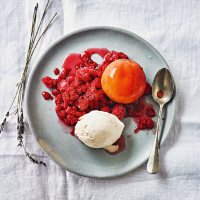 Serve the peaches with scoops of vanilla ice cream, a little of the syrup and the raspberry granita.